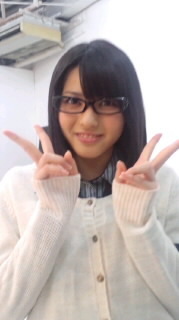 In her update at the official ℃-ute blog for 11/21, Maimi started by showing off some glasses she wore for a photo shoot (picture 1) and noted that it’s rare for her to wear glasses. She then wrote that she got to eat pizza with the rest of the members of ℃-ute (pictures 2 and 3), and that it was “Buono!”. Maimi also let us know that she saved the day by finding Airi’s lost wristwatch and Chisato’s lost earphones at their get-together. Her full update can be read here. Maimi started updating her SWEET TIME mini-blog early today, letting us know that she had a cheese omelette for breakfast. Continuing with the food theme of the day, Maimi also wrote that she had something like black sesame seed pudding and shared a picture from her work for the day (picture 4). 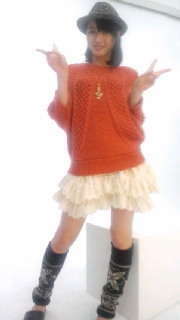 Posted on November 22, 2010, in Blog, Translations and tagged Yajima Maimi. Bookmark the permalink. 1 Comment. O, want a pretty girl!